SCE’s Emergency Operations Center is the company’s hub for disaster training and response. A new SCE course brings together local representatives to work with first responders. In 2015, when the call came in of an oil spill off of Refugio State Beach in Santa Barbara County, emergency officials immediately leaped into action. 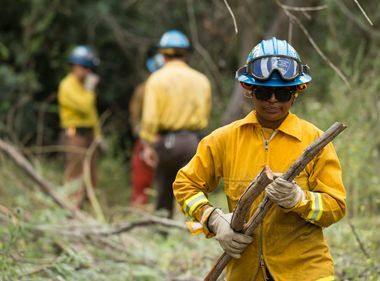 Santa Barbara County’s Office of Emergency Management, Plains All American Pipeline, Southern California Edison, the U.S. Coast Guard, California Department of Fish & Wildlife and a host of local, state and federal agencies responded. 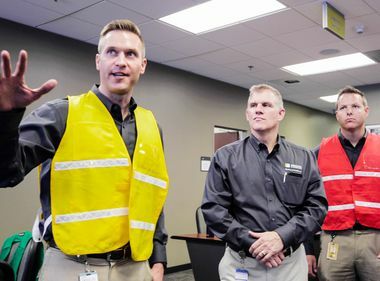 They organized under the Incident Command System, an organizational structure used across the country to respond to wildfires, floods, earthquakes and other disasters. It was during the after-action review that Robert Lewin, Santa Barbara County’s director of emergency management, realized there was a disconnect during the response between the command structure and non-governmental organizations like environmental groups. It builds better relationships, closer relationships between SCE and its emergency partners so that in a response, we won’t be meeting for the first time and have to exchange business cards to know who we’ll be working with. “They had a clear ability to assist, but didn’t know how to plug in,” he said. Lewin thought the non-governmental organizations should be included in the incident management process and would fit best in the role of agency representative — basically a liaison between their organization and the incident management team. He knew SCE had been doing extensive Incident Command System staff training to respond to emergencies and asked if the utility could modify its course to cover the basics for outside groups and city and county government staff. The first class was in Santa Barbara in June, 2017, followed two months later by another session in Ventura County. This year, SCE taught the class in Orange, Los Angeles, Riverside and San Bernardino counties and has a course scheduled for the California Utilities Emergency Association in September. Thomas Jacobus, SCE’s principal manager of business resiliency, said what started as an experiment has proven to be invaluable. 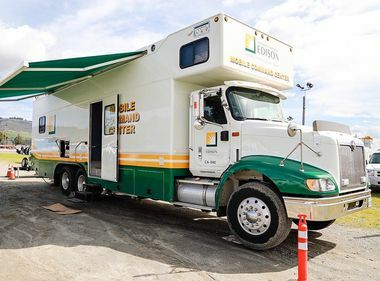 “It builds better relationships, closer relationships between SCE and its emergency partners so that in a response, we won’t be meeting for the first time and have to exchange business cards to know who we’ll be working with,” he said. The class is also aimed at helping nonprofits, volunteers and other non-emergency organizations navigate what can be a daunting command structure and alphabet soup of acronyms commonly used by SCE and emergency services during a response. “We don’t want you to sit at an EOC (emergency operations center) and have no clue what is being talked about or what your role is,” said Ranger Dorn, the class instructor and a 42-year veteran of the fire service and the Incident Command System. Representatives of non-emergency groups at the recent Los Angeles class included California State University, Northridge and the Los Angeles County’s Access paratransit service. In addition to teaching the basic structure, language and who’s who of the Incident Command System, the class also has breakout sessions for attendees to work through real-life scenarios they might face. For example, scenarios at the recent Los Angeles class included a power outage at a hospital that extended eight blocks around the medical facility and a wildfire on the border of two counties that required a hazardous materials response. Lewin said the training and the opportunity for SCE and various agencies and non-governmental groups to know each other and become familiar with each other’s operations has had an immediate payoff in terms of closer communication and coordination.